Note: In the beginning of the Japanese colonial rule, Taiwanese aborigines soon became targets of the 'savage administration' of the colonial government. They also were objects in the construction of the anthropological knowledge. In the unfolding of colonial governance and knowledge construction, the production of photographic images of Taiwanese aborigines developed as well. The formation of photographic archives of Taiwanese aborigines was part of official ethnography of the 'savage administration' as well as the use of photograph as a modern ethnological method. Anthropological photographic experiences during this period were both records of documentary photography of aboriginal governance and of representation of constructing ethnic-type categories. Drawing on ethnographic photos taken by the 'savage administration' and anthropologists, this article discusses official documentary photography and type photographs. It also analyzes field experiences of anthropologists, the production processes of photographic archives, and the reaction of the photographed. When Tori Ryuzo came to Taiwan the third time in 1898 to research on the indigenous people in Taitung and Hengchun, he wrote a letter to Tsuboi Shōgorō in the field, explaining how he acquired an initial understanding toward the so-called The Darkest Formosa – Eastern Taiwan and Orchid Island after three expeditions (1896 Taitung and Hualien, 1897 Orchid Island, 1898 Taitung and Hengchun), and “with good luck I’ve brought a silver lining to Eastern Taiwan and Orchid Island where they are lying in the dark.”(註5) The ‘dark’ in Tori’s ‘The Darkest Formosa,’ or ’The Dark Savage Realm’ mentioned in his earlier article which was published in 1896 when he first went on expedition to Eastern Taiwan (Indigenous Tribes in Eastern Taiwan and Their Distribution)(東部臺灣に於ける各蕃族及び其分布), (註6) in a way was to patch up the various cultural forms and distributions of indigenous tribes in Eastern Taiwan which are lacking in the evidential ethnographic research; on the other hand also acting as a metaphorical expression for Tori whom ‘has brought a silver lining’ and explicitly indicating his tools he brought when his in the field: a box camera. Through beams of lights, the silhouette of communities of indigenous people in Eastern Taiwan was captured in camera obscura. After the films were developed, they become the first-handed documents that can stress the anthropological evidential science were undoubtedly on-site and were used as mediums to ascertain physical features and pick up cultural identification for acting as a comparative ethnographic research method. 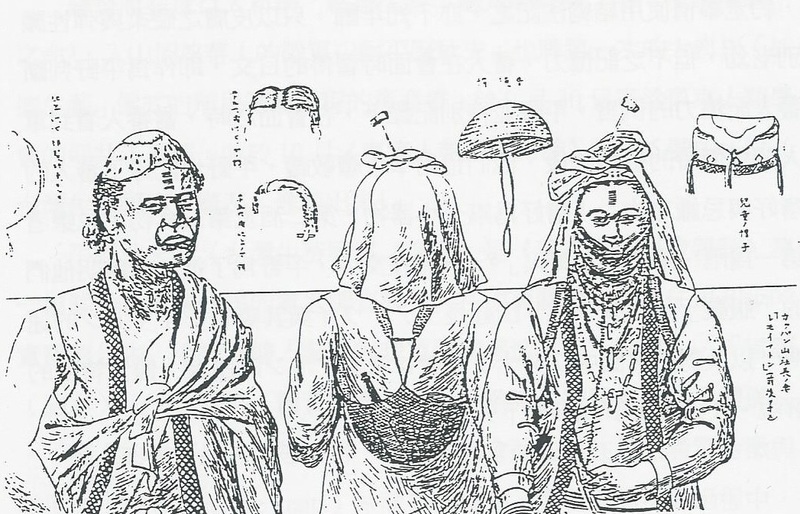 At the beginning of the Japanese colonial period, Taiwanese indigenous people are not only subject to colonizers’ savage controlling administration, but the subject of the knowledge construction of the ethnography of colonies. In the process of embarking on colony governance and knowledge establishing, anthropological photographic archives started to develop. This article discusses official documentary photography and typological image through the analysis of the early stage savage governance institution and anthropologists’ ethnographic image and going forward, with the field photographic experience documented in anthropologists’ field diary, to further analyze the producing of the photographic archive and the response of the photographed. The report that Akiro published has immediately gotten revised by the member of Anthropological Society of Tokyo and employee of Government of Formosa Ino Kanori. (註10) On January 1896 Ino Kanori published “The Local Savages of Toa ko kan (大嵙崁, 地方に於ける生蕃)” in The Journal of Anthropological Society Tokyo to respond to Akiro Hirano’s report. (註11) The article which Ino published also included a needle-point portrait sketch of the photograph where three indigenous people went to the Government of Formosa to join the meeting. The sketch is speculated to be drawn by the painter of Anthropological Society of Tokyo Ohno Kumo, who did the sketch based on the photograph. Later on, the picture of indigenous people’s physical and cultural features which Tori Ryuzo used along with his article when he published his first research paper on Taiwan was also drawn by Ohno Kumo based on the actual photograph that Tory has taken. The discussions rounded the ceremony in Tao ko kan’s ‘savage amelioration’ between Akiro Hirano, and Ino Kanori was a colonial issue in The Journal of Anthropological Society of Tokyo. During this particular event, the question (ethnic group categorization) that has taken concern in Colonial Anthropology and the theoretical resources and analytical methods using in discussions has started to come to its prototype. In a research paper that discusses from Tao ko kan indigenous people’s physical, lingual, cultural features to racial categorization, the photograph which Ino used is taken on 10, September, 1895 right after when governor-general Kabayama Sukenori’s declaration of Savage Amelioration, he met and greeted the five Atayal indigenous people from Jiaoban Mountain and She-Na-Cheng community in the Government of Formosa. 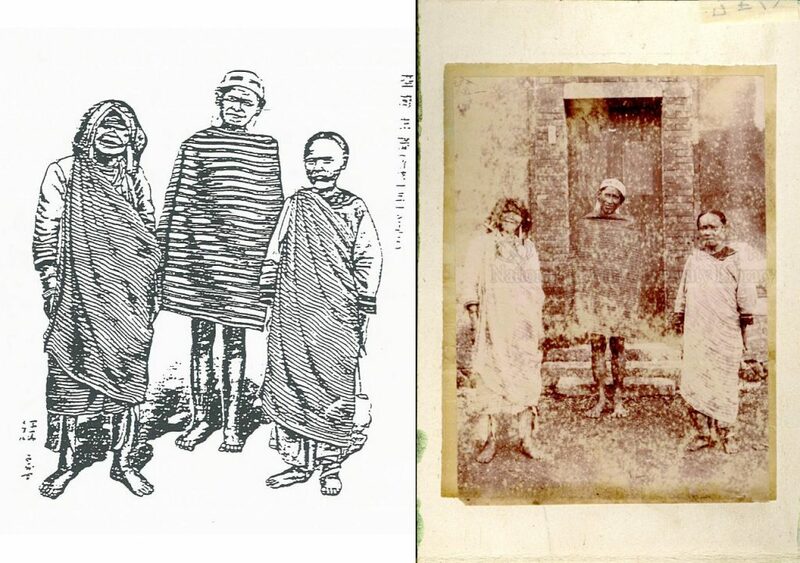 If comparing Ino’s portrait sketch and the actual photograph that Ino’s article based on, discovery can be found that Ohno Kumo from Anthropological Society of Tokyo erased and left blank space on where the door, stairs, and walls originally were, meanwhile accentuated the cultural features of indigenous people’s physic and clothing but kept the feature where one of the indigenous people was wearing a Han women’s coat with embroidery on the seams. 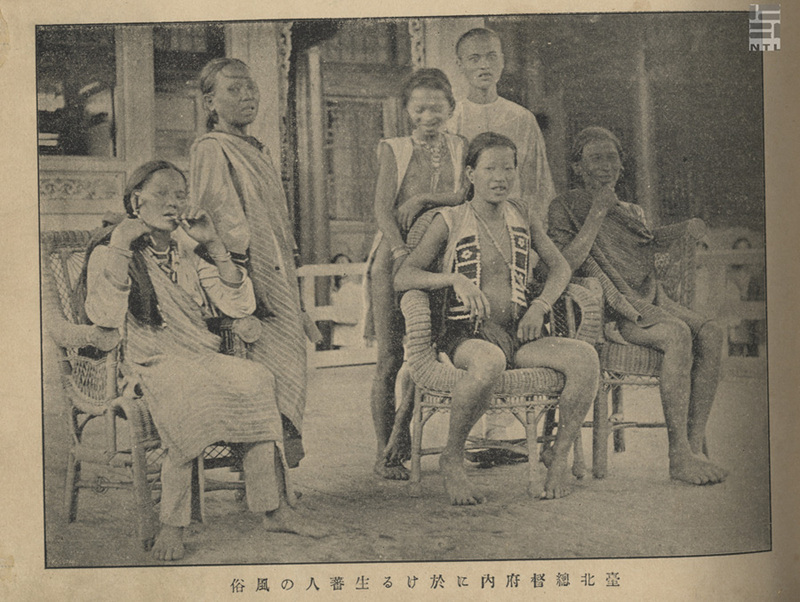 When the Savage Amelioration was ongoing, Tao ko kan’s Atayal people had been into Taipei city to meet with the governor-general and taken at least three photographs during (see the photographs attached to this article), thus left the image documentation of indigenous people from earliest colonial reign. One of the photographs Governor-general Kabayama and Indigenous People’s Earliest Meeting (Fig. 3) is a group photo of five indigenous people, the governor-general and high-ranking officers. The other one Taiwanese Indigenous People (Fig. 2) – a group photo of three indigenous people that was taken by the wall inside the Government of Formosa is a file that was published by Ino Kanori on The Journal of Anthropological Society Tokyo. Moreover, the indigenous people who came into Taipei city to meet the governor-general also left another photograph on the same platform where they had taken the photo with governor-general before with the name The Savage Convention that was shot in Taipei Government of Formosa (Fig. 4). This one was shot in-between the group photo with the governor-general, another photograph with only the five indigenous people and a translator. Three of the five indigenous people even sat on the seats of governor-general Kabayama Sukenori, chief of civil department Mizuno, and chief of navy Kakuda Hideshiro; the five stared at different directions, chatted and laughed in an innate manner. 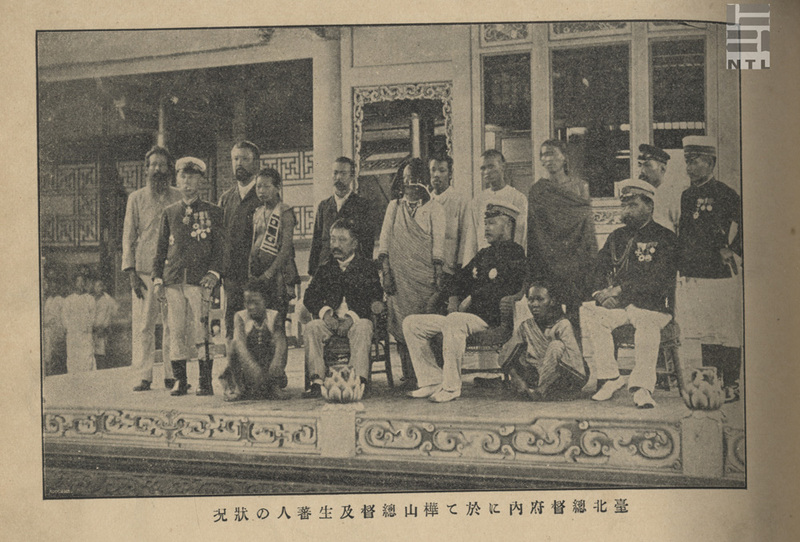 If compared with the governor-general meeting photo; one presents governor-general Kubayama Sukenori as the focal point with indigenous people either squatting or standing between governor-general and high-ranking officers from the Government of Formosa, and with everyone displaying a solemn look, focusing their eyesights on the left side. Maybe there was another camera on the left side? (註12) The other is relatively free and liberated in a relaxed atmosphere and seems like a picture that was captured by the photographer in a moment of frolicking. It is also a rare image of indigenous people where the figures in it are showing smiley faces; it is hard to see smiles on indigenous people on photographs whether it was captured in a photo studio or in the fields. After the instruction of Savage Amelioration was ordered by the governor-general in 1895, the early stage of Japan’s reign over Taiwan; the three photographs that was shot in the Government of Formosa: Taiwanese Indigenous People, Governor-general Kabayama and Indigenous People’s Earliest Meeting, and The Savage Convention that was shot in Taipei Government of Formosa, the development and careers of them seemingly prognosticate the start of colonization and ruling later on and how the images of Taiwanese indigenous people would be produced and circulated. ‘Taiwanese Savage’ becomes the material for the knowledge production of Colonial Anthropology and through anthropologists like Ino Kanori, Tori Ryuzo, Mori Ushinosuke, and others, develop the ethnographic method of using images of indigenous people as tools to continue producing and accumulating colonial anthropological indigenous people images. Governor-general Kabayama and Indigenous People’s Earliest Meeting, and The Savage Convention that was shot in Taipei Government of Formosa were first put into military photographer Endo Makoto’s collection album 《征臺軍凱旋紀念帖》, then reproduced later in various official ethnographic reports. The colonial government would later follow former with their savage control administration and shot, collect, and publish many images of indigenous people. Furthermore, through the copying and postcard producing by officials and photography studios, these postcards are either sent back to the country of the colonizers or abroad. (註13) Through Colonial Anthropology, ethnography from official institutions and photographic postcards, the producing and circulating of images of indigenous people gradually accumulates something that maybe could be called photographs of aborigines as colonial archives. Discussions about western anthropological development, its relationship in-between photography and its history, please see Elizabeth Edwards ed. Anthropology and Photography, 1860-1920, (New Haven and London: Yale University Press in Association with The Royal Anthropological Institute, 1992)，Elizabrth Edwards, “Anthropology and Photography: A Long History of Knowledge and Affect,” Photographies, 8(3)(2015): 235-252. Christopher Morton and Elizabeth Edwards ed. Photography, Anthropology and History: Expanding the Frame, (Surrey: Ashgate, 2009) and Christopher Pinney, Photography and Anthropology, (London: Reaktion Books, 2011). Photography as a technique of representation, modernity, and national relationship, see John Tagg, The Burden of Representation: Essays on Photographies and Histories, (London: The MacMillan Press LTD,1988). Analysis of Tori Ryuzo’s ethnographic photography and its anthropological knowledge please see Hyung Il Pai, Capturing Visions of Japan’s Prehistoric Past: Tori Ryuzo’s Field Photographs of ‘Primitive’ Races and Lost Civilizations (1896-1915). Jennifer Purtle and Hans Bjarne Thomson (ed.) Looking Modern: East Asia Visual Culture from Treaty Ports to World War II, 2009. 265-293. Wang Ka F., “Entanglements of Ethnographic Images: Tori Ryuzo’s Photographic Record of Taiwan Aborigines (1896-1900),” Japanese Studies 24(3): 283-299, 2004.謝以萱〈日治臺灣的田野踏查與攝影術（一）：殖民．人類學家．乾版攝影 (Field Research and Photography in Japanese Colonial Period Taiwan Ⅰ: Colonialism, Anthropologist, Dry Plate Photography)〉, http://www.biosmonthly.com/weekly_news_topic/7736.〈日治臺灣的田野踏查與攝影術（二）：背著相機的人類學家—鳥居龍藏 × 森丑之助 (Field Research and Photography in Japanese Colonial Period Taiwan Ⅱ: Anthropologists Who Carried Cameras-Tori Ryozo and Mori Ushinoke)〉, http://www.biosmonthly.com/weekly_news_topic/7737. 〈日治臺灣的田野踏查與攝影術（三）：田野日誌與圖譜漫談 (Field Research and Photography in Japanese Colonial Period Taiwan Ⅲ: Field Research Diary and Map Ramble)〉, http://www.biosmonthly.com/weekly_news_topic/7738。（Retrieved 09.26. 2016). Starting from the founding of the Anthropological Society of Tokyo, Tsuboi Shōgorō had employed various image representation techniques, such as sketch, illustration, and photography. Please see Inhye Kang, “Visual Technologies of Imperial Anthropology: Tsuboi Shogoro and Multiethnic Japanese Empire.” Positions 24(4): 761-787, 2016. Tori Ryuzo, 〈臺灣東南部の人類學的探檢 (Anthropological Adventure in Southeast Taiwan)〉. The letter was originally published in December 1888, Tori Ryuzo sent the letter to Tsuboi Shōgorō from the Anthropological Society of Tokyo and later published it in The Journal of the Anthropological Society of Tōkyō. Tori Ryuzo, 〈東部臺灣に於ける各蕃族及び其分布 (Indigenous Tribes in Eastern Taiwan and Their Distribution)〉, The Journal of the Anthropological Society of Tōkyō 136 (1897): 378-410. 《鳥居全集 (The Collection of Tori Ryuzo)》, Volume 11, page 464-485. Taiwan Adventure, page 140-190. This section is revised from writer’s previous research, please see Chen Wei-chi, 《伊能嘉矩：臺灣歷史民族誌的展開 (Ino Kanori and the Emergence of Historical Ethnography in Taiwan)》, (Taipei, NTU Press, 2014). Please see especially section one, chapter two. This article uses ‘indigenous people’ instead of ‘番’ or ‘蕃’ (savage) in principle when describing in a general manner, however, some would be kept as its original script to depict its original meaning or its historical lingual context. In 1934 upon the fiftieth anniversary of Anthropological Society of Tokyo, president Matsumura mentioned when reviewing the performance of Anthropological Society of Tokyo that; with the expanding of Japan empire, Taiwan has become new territory for anthropological research. Akiro Hirano’s report was the first to be published after Japan has the reign over Taiwan. See: 松村瞭, 〈東京人類學會五十年史 (Anthropological Society of Tokyo’s History of 50 Years)〉, Journal of Anthropology 49 (11) (1934): 419-460. Ino Kanori,〈大嵙崁（Toa ko kan）地方に於ける生蕃〉,Journal of Anthropology118 (1896):151-154. Looking from the focal point and eyesight of the people in this photograph of meeting and the angle of shooting, there might have been another camera on the left side other than the camera from the photographer Makoto Endo on the right. Analysis of image postcards of Taiwan Indigenous people from the Japanese colonial period, see: Paul Barclay, “Peddling Postcards and Selling Empire: Image-Making in Taiwan under Japanese Colonial Rule.” Japanese Studies 30(1)(2010): 81-110. Taiwanese indigenous people are often the main theme of Image postcards in the Japanese colonial period. As for the relationship between pictural postcards and Japanese colonialism, see: Shi-Lung, Chang, 圖像明信片與殖民之眼：一些片段的思考 (Image Postcard and The Eyes of Colonialism: A Few Fragmented Thoughts)〉, Voice of Photography, 12(2014): 36-43.